We celebrate today the 20 year anniversary of the futures contracts on the PSI 20 index. To celebrate this anniversary, the team of BBVA Portugal (Luis Castro and Almeida (managing director), Manuel Ferreira and Daniel Mendes) rang the closing bell. The first futures contract on the PSI 20 index was launched 20 years ago, on 20 June 1996. By the end of the first month of existence, the volume reached more than 3,000 contracts, a number that contrasts with June 2016 with over than 84,000. In terms of total volume, over these 20 years, around 6.3 million futures contracts on the PSI 20 index were negotiated. Since the migration of the Portuguese derivatives market to the Euronext platform, the number of members has more than doubled to 47. For the number of contracts traded in 2016 (until 17 June = 215,000), the Portuguese financial intermediaries account for 36% of the volume, followed by the Spanish with 35%, while the British members account for 24% of that amount. In addition to futures contracts on the PSI 20 index, the benchmark of the market, there are currently 12 Single Stock Futures and 3 Single Stock Dividend Futures. Four financial intermediaries act as Liquidity Provider on the PSI 20 Index Future: BBVA (Portugal), Banco Santander, SA (Spain), DRW Investments (UK) and Société Générale (France). The first issue of Treasury Bonds, dedicated to retail investors, was listed in the regulated market on May 19. Initially set at €350 million, the Portuguese Treasury and Debt Management Agency (IGCP), which has issued this “OTRV Maio 2021” bond on behalf of the Portuguese government, increased the total amount to €750 million based on the demand surge on the first day of the subscription period. To celebrate the listing of €50 million in bonds, Benfica SAD management team rang the closing bell, along with the Euronext team. Bonds demand exceeded offer in 2.6 times. This bonds pay 4.25% in interest rate, and more than 6,800 investors purchased Benfica SAD 2016-2019 bonds. Isabel Ucha, interim CEO of Euronext Lisbon, Flavia Micelotta, executive director of Eurosif, an organisation that promotes sustainability among European financial markets, and Diana Guzman, director of the Carbon Disclosure Project for Southern Europe, talked to more than 40 guests about socially responsible investments and funds. These funds promote sustainability by funding projects with profitability targets under the low carbon economy, such as sustainable forests or other topics related to sustainable development. After the conference, they rang the closing bell. Euronext Lisbon and Portuguese Trade Chambers ring the closing bell to celebrate the Fifth Annual Meeting of Portuguese Trade Chambers around the world (25 were present in the meeting) to promote relations between the two institutions in order to exchange ideas on financing companies and the support that capital markets can provide in meeting this goal. Under the Global Money Week (GMW), more than 50 students rang the closing bell. Euronext Lisbon, together with the capital markets regulator (CMVM) celebrated the closing of the Global Money Week with presentations of both institutions to two schools (Primary School no. 2 and 3 Santa Iria da Azóia and wellness center social Forums of Salvaterra) under the project of promoting the Financial Literacy among young people. Global Money Week is an annual international event to create money awareness and takes place in the second week of March. Global Money Week engages children worldwide in learning how money works, including saving, creating livelihoods, gaining employment, and entrepreneurship. This year, in celebration of the International Women's Day, 33 stock exchanges around the world have joined the UN Global Compact, UN Women, WFE, WE, SSE and IFC's to Rang the bell in favor of Gender Equality. In Portugal, the United Nations Global Compact and Euronext Lisbon, joined this global initiative and promoted a conference to discuss this issue, whit the presence of the Secretary of State for Citizenship and Equality, Catarina Marcelino. At the round table promoted, several testimonies were shared about "The importance of companies in promoting gender equality and women's empowerment”. 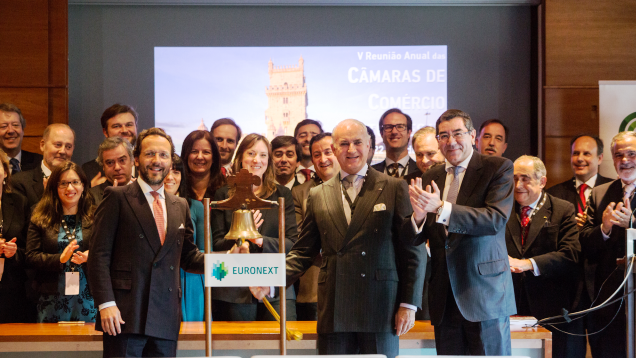 To celebrate the raising of €20 million in bonds, Douro Azul CEO, Mário Ferreira, rang the Closing Bell with the Euronext team. This issue aims to support the growth of Douro Azul Group's, that plans to issue in the near future more bonds in the amount of € 17.5 million. The Douro Azul Group, the largest operator of river cruises in Portugal, with an operation on the Douro River for more than 20 years , has activity in the tourism and leisure sector , with special focus on the segment of river cruises which currently represent 98% of its sales. In 2015, Mystic Invest acquired 100% of the German operator Nicko Cruises , becoming one of the major players in river cruising segment , operating in 12 different cities and three continents. Two 'mini -conferences' dedicated to issues related to the Family Business were held today in Euronext Lisbon. The first was entitled " CEO's Family Business and the motivation of its teams " and speaker was Carlos Douwens , Partner of Visconti , while the second discussed "The role of technology in the context of the Family Business " and was led by Luís Gravito , Business Development Manager Squad. After the event, they rang the closing bell. To celebrate the raising of €25 million in bonds, Lusiaves-SGPS rang the Closing Bell. 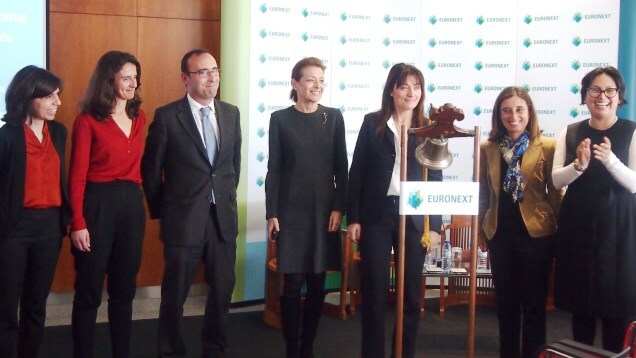 The CEO, Avelino Gaspar, was accompanied by Euronext team. The company assumed that it will invest € 100 million in 2016 to expand and internationalization of their business. Lusiaves’ activity is varied, from rearing reproductive hens through the production of eggs with the respective hatching and production of chicks, to the poultry production of broilers, free-range chicken and turkey, as well as poultry slaughtering and processing. Lusiaves also has a network for distributing and marketing food products. It has a factory for producing compound feed and has a plant for recovering and processing animal by-products. The launch of another edition of the Global Investment Challenge (GIC) was held in Euronext Lisbon. The event brought together around the same table the sponsors of GIC , which already has four editions. The start of the competition , which aims to test knowledge of the markets, is scheduled for February 3rd . Participation is free. The GIC is an online competition of 12 weeks. To celebrate the raising of €100 million in bonds, Violas-SGPS rang the Closing Bell. 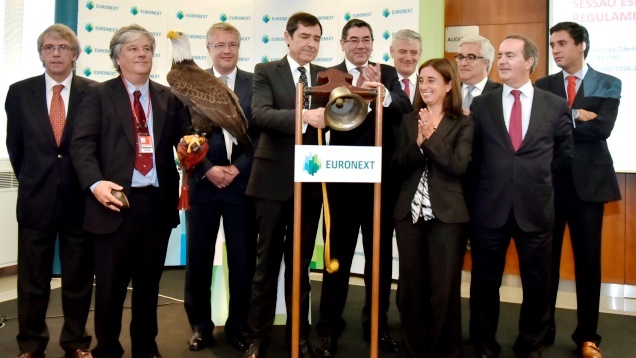 The chairman, Manuel Violas, was accompanied by management team, along with the Euronext team. Violas SGPS owns participations in Cotesi (textiles), Solverde (leisure) and Unicer (drinks). For the group, raising € 100 million in bonds was a financing alternative different of the ones used before, and considering current interest rates, an opportunity to review part of long-term debt. To celebrate the listing of €40 million in bonds, Hovione rang the Closing Bell. He was accompanied by management team, along with the Euronext team. Hovione is a Pharmaceutical Company dedicated to helping Pharmaceutical Customers bring new and off-patent drugs to market. To celebrate the listing of €45 million in bonds, Rui Cunha, deputy chairman, rang the Closing Bell. He was accompanied by Benfica SAD management team, along with the Euronext team. Bonds demand exceeded offer in 1.7 times. This bonds pay 4.75% in interest rate, and more than 5,200 investors purchased Benfica SAD 2015-2018 bonds. 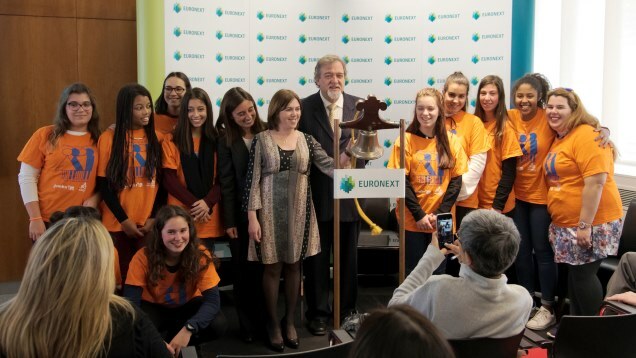 Junior Achievement Portugal rang the opening bell to promote Junior Achievement Europe Enterprise Challenge, the Fair of the best business ideas generated over StartUp Programme across Europe that happens in Lisbon. CFO of Millennium bcp rang the closing bell to commemorate the results of the Offer of debt for Equity swap. With this operation, the bank increases the share capital in more than EUR400 million. 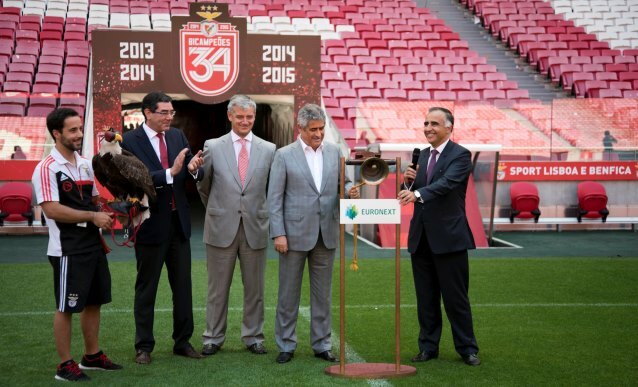 On Tuesday 26, Euronext Lisbon brought its Bell to Benfica Stadium (also known as Catedral) to celebrate the victory of the National Championship Cup by this soccer club. Benfica SAD is listed in Euronext Lisbon since May 2007. Luís Laginha de Sousa and Miguel Geraldes from Euronext Lisbon were received by Luís Filipe Vieira and Domingos Soares de Oliveira (CEO and CFO of Benfica) to ring the Closing Bell, on an historic ceremony, with an eagle overflying the stadium before the time of the ringing - the Eagle is the symbol of this club and it is a tradition to see the real eagle flying before an important event. To celebrate the listing of €45 million in bonds, Fernando Gomesrang the Closing Bell. He was accompanied by Porto SAD management team, along with the Euronext team. Bonds demand exceeded offer in 2.4 times. This bonds pay 5% in interest rate, and almost 4,800 investors purchased FC Porto SAD 2015-2018 bonds. To celebrate the listing of €30 million in bonds, Bruno de Carvalho rang the Closing Bell. He was accompanied by Sporting SAD management team, along with the Euronext team. Bonds demand exceeded offer in 2.6 times. This bonds pay 6,25% in interest rate, and more than 4,200 investors bought Sporting SAD 2015-2018 bonds. Following the announcement on April 27 regarding the launching of Tech 40 label, Eric Forest was in Lisbon on May, 6 to promote this initiative next to the Portuguese partners. The two Portuguese companies that were selected to be part of this initiative (Impresa and Novabase) as well as Carlos Oliveira, former Secretary of State for Innovation and a member of the expert committee, joined Eric Forest on a Closing Bell, with the presence of media. Tech 40 is a label recognising innovative European SMEs listed on the markets it covers. Each year Tech 40 will allow 40 top-performing European companies to benefit from premium services. It is one of a series of measures adopted by EnterNext since 2014 to boost the visibility of tech companies on financial markets and provide special assistance to them. On Wednesday, April 29, representatives from the Make-A-Wish Foundation rang the bell on Euronext markets in Europe to celebrate the World Wish Day. Lisbon welcomes one child whose wish was granted. And the Director of Make a Wish Portugal rang the closing bell. In Lisbon, the bell was rang by Teresa Morais, Secretary of State of Parliamentary Affairs and Equality, during a conference organized by Commission for Citizenship and Gender Equality. CEO of GRACE, Paula Guimarães, along with the former presidents celebrated the 15th anniversary of the non-profit association dedicated to the theme of Corporate Social Responsibility with a closing bell ceremony. Founded in February 2000 by a group of companies interested in deepening the role of the business sector in social development, GRACE is a pioneer association, non-profit and exclusively dedicated to promoting Corporate Social Responsibility. The GRACE brings together more than 100 companies, of all sizes and sectors of activity, committed to further developing the role of business in social development of people and organizations, sharing the mission have long assumed: reflect, promote and develop corporate social responsibility Portugal.